For the Alexander Wang’s show, sportswear was a huge inspiration for the season – skin turtleneck tops, netted and meshes fabrics, as well as bomber jackets were all seen on the runway. The colours and prints on the tops, jackets and dresses were bold and creative, which gave the outfits a strong statement finish. I particularly like these outfits as they are so easy to pair up. Note their simplicity; you could pair a plain coloured skin turtleneck top with a matching coloured blazer, along with tailored quarter length trousers. This will create a strong look that is simplistic and effortless. Complete the outfit off with an ankle strap open-toed heel (personally I am not a fan of those trainer heels), and a clutch bag. Alternatively, go with a one shade colour outfit such as the above: a grey round neck skin tight top paired with trousers in a ‘darker shade of grey’ and finished off with a grey bag and heels (cue the 50 shades of grey pun). Initially when I saw these outfits I didn’t feel inspired to review them as I wasn’t much of a fan. It’s one of those cases where they look good on the runway, due to the models being styled in a simplistic way which looks fresh and clean, but in the ‘real’ world it may not translate so well. I feel these outfits would be tricky to wear – the prints are very bold, and it would take a girl who is very comfortable in her own skin to pull this off; very little makeup and hair styling is necessary, and I know some people may not be comfortable with that (but you gotta love your own skin!). You ideally need to create a clean look with minimal makeup, whilst keeping accessories to a minimum in order to draw complete attention to the outfit. 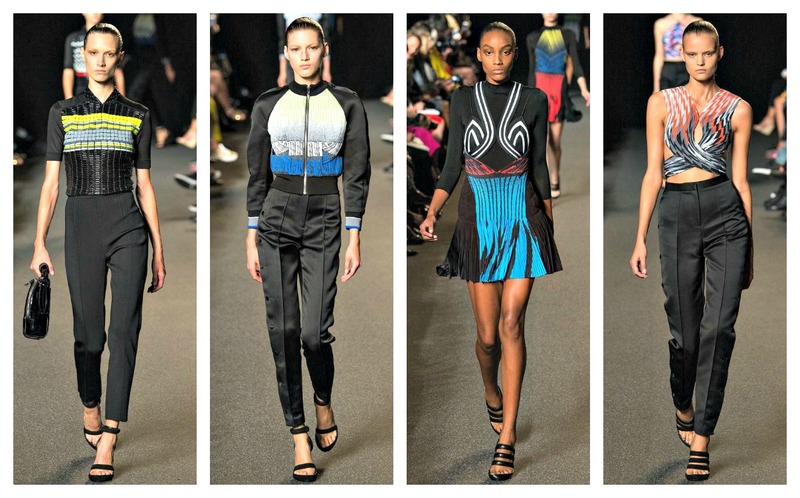 The show finished with these looks that I picked out, showcasing strong and bold prints. If you’re attempting this look, make sure to keep the rest simple as to avoid clashing with other parts of your outfit. As you can see Wang is no stranger to sportswear inspirations. The look on the left is from his recent show, whilst the look on the right comes from his 2010 collection – both similar looking outfits. It is clear that some of the inspirations from this season also came from Balenciaga’s past collection. He was recently appointed to design for Balenciaga and therefore I believe the designer may have delved into Balenciaga’s archives. Please leave a comment. Thank you!